miketheterrible wrote: Hey, what is the difference between all these different Iskander missiles? What makes this variant different than the others? You have cruise missile iskanders, at least 2 variants I think with one very long range according to US data, you have BM iskander 10-15m precision, you have Iskander-M with electroptical final guidance 5m precision. And then probably new stealthier missiles being developed with more modern technology. As reported by the newspaper "Krasnaya Zvezda" in the material published on November 23, 2017 by Alexander Tikhonov and Victor Khudoleev "On Resources of Defense Significance", "the other day at the Kapustin Yar test site a solemn ceremony of presenting the next brigade set of the Iskander-M operational-tactical missile system the personnel of the Guards missile unit of the Western Military District. The military commander of the Guards missile brigade, commanded by the Guards Colonel Anatoly Gorodetsky, was congratulated by Lieutenant-General Mikhail Matveyevsky, the commander-in-chief of the Missile Forces and Artillery of the Armed Forces of the Russian Federation, Lieutenant-General Victor Lizvinsky, Deputy Commander-in-Chief of the Land Forces for Armament, and representatives of the defense industry enterprises. This is the 11th missile connection of the Ground Forces, completely transferred to the operation of a modern missile system in recent times. To the personnel of the Guards missile brigade, the manufacturing enterprise transferred launchers, transport-loading and command-staff vehicles, life support equipment, regulations and maintenance, the information preparation center. At present, in the 60th training center for missile forces located in the Astrakhan region, the crews of the missile unit began to work out practical actions on the modern missile system. The final stage of the rearmament of the missile compound will be a tactical exercise, after which all the personnel of the junction will go by rail to the place of permanent deployment. " On the bmpd side, we recall that on November 22, 2017, the Department of Information and Communications of the Ministry of Defense of the Russian Federation reported that at the Kapustin Yar test site a solemn ceremony of handing the brigade kit of the Iskander-M tactical missile system to the personnel of the Western military district (ZVO). The solemn ceremony was attended by Lieutenant-General Mikhail Matveyevsky, commander-in-chief of the Missile Forces and Artillery of the Armed Forces of the Russian Federation, Lieutenant-General Viktor Lizvinsky, Deputy Commander-in-Chief of the Land Forces, and representatives of the defense industry enterprises. This is the eleventh missile connection of the Ground Forces, completely transferred to the operation of a modern missile system in recent times. The personnel of the missile brigade were transferred to several tens of launchers, transport-loading and command-staff vehicles, life support equipment, regulations and maintenance, the point of preparation of information. At present, in the 60th Training Center for Missile Troops (located in the Astrakhan Region), the crews of the missile unit began to work out practical actions on a modern missile system. On the bmpd side, we will point out that the 152nd Guards missile brigade of the 11th Army Corps of the Baltic Fleet stationed in Chernyakhovsk (the Kaliningrad Region) is the Guards missile brigade of the Western Military District commanded by Guards Colonel Anatoly Gorodetsky. "In the past year, the connection was transferred to a new organizational and staff structure, the command staff began to implement a new program of combined arms training for young servicemen, and retraining of personnel for work on new missile systems began. At the present time, a considerable part of it is located at a remote training ground where the next teaching. " 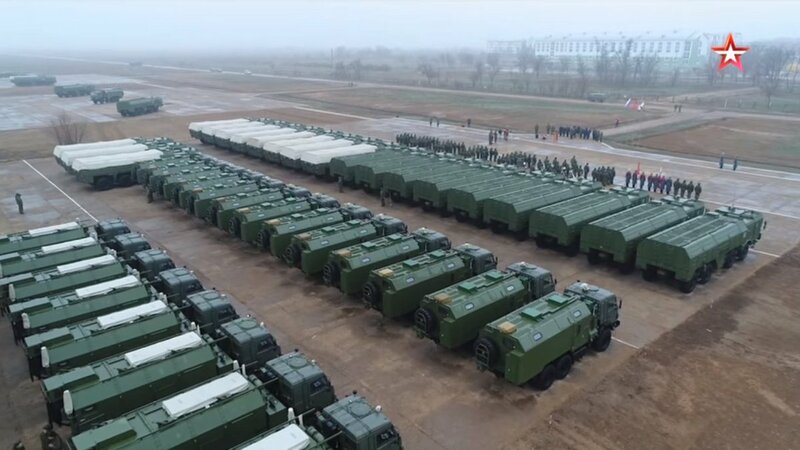 As our blog reported earlier, the magazine "Jane's Defense Weekly" published a satellite image made on February 10, 2017, demonstrating that at the site of the deployment of the 152nd Guards Missile Brigade in Chernyakhovsk, Kaliningrad Region, eight new tentmobile huts were completed by the time of construction, approximately 54 by 22 meters in size to accommodate the Iskander-M missile defenses, and at least five more TMUs were built. The set of the missile complex 9K720 Iskander-M, transferred to the 152nd Guards Missile Brigade, was the tenth and final such brigade kit delivered under the state contract З / 3/1 / 24-11-DGOZ dated August 4, 2011 between the Ministry of Defense of Russia and the AO "Scientific and production corporation KB Mechanical Engineering", as the sole supplier of the Iskander-M OTRK, for the supply of ten brigade sets of the Iskander-M complex. Taking into account the brigade set of the Iskander-M missile system delivered in 2010-2011, now 11 missile brigades of the Russian Ground Forces are equipped with this complex. In 2013, in accordance with a contract dated August 4, 2011, NPK KB Engineering has transferred to the Ministry of Defense of Russia two brigade sets of Iskander-M missile systems that were supplied to equip the 107th separate missile brigade of the Eastern Military District (stationed in Birobidzhan) and the 1st separate Guards missile brigade of the Southern Military District (Krasnodar). In 2014, under this contract, the MSC transferred two brigade sets of the Iskander-M missile defense system, supplied to equip the 112th Guards missile brigade of the Western Military District (stationed in Shuya, Ivanovo Region) and the 92nd Separate Missile Brigade of the Central Military District located in Totskoye-2, the Orenburg region). In 2015, under this contract, the MSC transferred two brigade sets of Iskander-M missile systems that were supplied to the 103rd separate Missile Red Banner Brigade of the Eastern Military District (stationed in Ulan-Ude) and the newly formed 12th Separate Missile Brigade of the Southern Military District stationed in Mozdok, North Ossetia). In 2016, under this contract, the MSC transferred two brigade sets of the Iskander-M missile defense system, which were supplied to equip the 20th Guards missile Berlin twice with the Red Banner Brigade of the 5th Combined Military Army of the Eastern Military District (stationed in Ussuriisk, Primorsky Territory) and the 119th separate missile brigade of the 41st Combined-Arms Army of the Central Military District (stationed in the village of Elanskiy, Sverdlovsk Region). Finally, in June 2017, the ninth brigade set of the Iskander-M missile unit entered the equipment of the newly formed 3rd Rocket Brigade of the 29th All-Military Army of the Eastern Military District stationed in the village of Gorny (Chita-46) of the Transbaikal Territory, 70 km to the south from Chita. In addition, before the conclusion of the 2011 contract with OAO NPK KB Engineering, the brigade set of Iskander-M missile brigade was equipped with the 26th separate missile brigade of the Western Military District (Luga, Leningrad Region) in 2010-2011. Iskander-M missile was in service with the first 630th separate missile battalion of the 60th training center for the combat use of the Missile Forces and Artillery of the Russian Land Forces in Kapustin Yar (2005-2007), which also carried out the first combat employment of this complex entrance Five-day war with Georgia in August 2008). Thus, only one missile brigade remained in the Armed Forces of Russia, retaining the old OTSC "Tochka-U" - the 448th missile brigade of the Western Military District stationed in Kursk. On August 24, 2017, it was reported that the Ministry of Defense of the Russian Federation had concluded a new contract with JSC "Scientific and Production Corporation" KB Machine Building "for the supply of two more brigade sets of the Iskander-M operational-tactical missile systems. The 448th rocket brigade in Kursk will be rearmed to Iskander-M missile systems. As reported on December 5, 2017 by the press service of the Western Military District (ZVO), "the missile connection of the 20th Army of the ZVO will receive new equipment"
The bmpd comment. Thus, we are talking about the upcoming rearmament of the 9K720 Iskander-M missile systems (operational missile systems) deployed in Kursk by the 448th rocket brigade of the 20th Guards Combined-Arms Army of the ZVO. To date, the 448th rocket brigade has remained the only one of the 12 deployed missile brigades in the Russian Armed Forces, maintaining the obsolete PKK 9K79-1 "Tochka-U". The remaining 11 missile brigades received brigade sets of the Iskander-M missile brigade from 2010 to 2017 (nine brigades were rearmed from the Tochka-U OTRK and two brigades, the 3rd and the 12th, were additionally formed). Apparently, the 448th rocket brigade will receive in 2018 the first of two additional brigade sets of the Iskander-M missile defense company under a contract signed in August 2017 by the Ministry of Defense of the Russian Federation with JSC Scientific and Production Corporation KB Mechanical Engineering. that the second brigade set of the Iskander-M missile defense unit under this contract will be used to form a new missile brigade as part of the formed 8th Guards Common Arms Army of the Southern Military District. Would be hard to calculate as it is based on an older missile... I think it was called OKA, which NATO called SS-23 Spider. Obviously with shorter range as the older missile was a pre INF treaty design and Iskander a post INF treaty design. Anyway Iskander is superior by any measure. IMO lends credence to the theory of the Kinzhal being a modified Iskander-M. Still quite an impressive weapon and capability. Now they might have backported some of the changes to the baseline Iskander-M. I've long suspected that Russia will introduce a mobile anti-ship SRBM/IRBM as the Chinese have done with their DF-26, and maybe they have now done just that? I certainly hope so, as anything that works towards neutralising HATOstani naval forces is a positive in my book. minor gripe: the vpk article shows a photo of Iskander-K (cruise missile) rather than the quasi-ballistic M. Still, I'll bet their are AShM variants of this missile as well as the K is likely built around common technology shared with the Kalibres. MOSCOW, September 19. /TASS/. Russia’s Iskander-M mobile short-range ballistic missile systems were for the first time ever redeployed from Urals to Kyrgyzstan to take part in the upcoming international counter-terrorism exercise, Issyk-Kul Antiterror-2018, the press service of Russia’s Central Military District said on Wednesday. "Iskander-M mobile short-range ballistic missile systems were for the first time ever deployed in Kyrgyzstan. During the drills, Urals missile crews will carry out a strike on a simulated base of terrorists at the Edelweiss mountain training range," the press service said. About a thousand of Russian servicemen will take part in Issyk-Kul Antiterror-2018 exercise of the Commonwealth of Independent States (CIS), scheduled to take place on September 24-24 at the Edelweiss training center in Kyrgyzstan. Operational-tactical Iskander-M fires super maneuverable quasi ballistic stealth missiles (50 km altitude) with electronic warfare, designed to pierce the adversary’s missile defense and destroy targets at a distance of 500 km. What are chances of patriot/thaad/aegis/phalanx western AD of taking down iskander? We here so much about that the west has nothing to defeat it is this true? And phalanx/goalkeeper chances of destroying it? Also with mention of sea targets what kind of effect would one missile be on an aircraft carrier or large warship? d_taddei2 wrote: Just a quick couple of questions. Yes there is always a chance, but this is not AFAIK about if missiles or rounds hit it. If ti hits game's over. It is about fire control systems if they can follow something flying 6-8 Ma. Not sure what is Iskander' speed close to earth but if is 8 Ma = 2,7km/s and can maneuver it is unlikely any FCS can effectively take it down. Look at thsi "super dooper most advanced" Israeli Dome system. It hardly copies with fairly primitive Hamas/Hizbollach missiles. Same in KSA, when Yemen resistance fires "ballistic" S-125 PAtriots take it down. From time to time. With large ships the problem is range. CSG unlikely comes to shore closer then 500kms. Smaller ships around Japan or Baltic/Black Sea is more probable. Large ship hit but something weighting 2 tonnes (Iskander is 1 stage mssile) with speed of ~2,5km/s needs virtually no chemical energy, kinetic enrgy is close to point where adding explosives make little sense. So definitely after hit of iskander CVN is unlikley to be able to do anything besides survive and being towed or just being sank. Not sure if those P-800 had explosives on board. They still get with 2,5 Ma not 8Ma. For an interceptor guided missile the problem is the same... you are flying to a point in space ahead of the target and the puzzle is to determine that position in 4 dimensional space (ie latitude, longitude, altitude and the same time). If the time is out by 1 second you will miss by 3.2km... half a second and you miss by 1.8km... so half a second miss and even a nuclear warhead will not compensate for the miss distance. The point is that unlike a ballistic missile that is basically falling with minor corrections to keep it on target, a semi ballistic missile like Iskander or Kinzhal, they are flying and manouvering so it is like a plane... you don't know where it will steer and when it will slow down or speed up or climb or turn and because of the speed it is travelling at you can have you missiles heading to an intercept point and a single turn means those missiles you launched don't have the time or the energy to make it to a new intercept point in time to be there at the same time as the threat missile... as I said... half a second means a miss by 1.8km. It is not just western missiles that will have problems with this sort of target... Russian missiles are designed to engage high speed ballistic targets... not hypersonic aerodynamic targets. The Iskander won't be moving at Mach 10 in the terminal stage. It has various sorts of optical seekers that just won't work when there's a big layer of plasma surrounding the cone. Depending on model. Apparently, according to mod, there are something like 8 different versions of the Iskander missile. Cruise missiles being different entirely I think. Maybe Khinzal being part of that too. But Iskander moves maximum to around Mach 6. Which nothing made now can really intercept that speed. A target that flies in a quasi ballistic state is darn near impossible for both Russia and US. Iskander is believed to fly at between mach 6 and mach 8 to about 500km. The Kinzhal is basically the same missile, but when launched from 10km altitude already moving at mach 2 - mach 2.5 then the additional energy extends range and flight speed... a maximum range engagement one would expect a lofted trajectory and a fairly steep dive on target at rather high speed. The development of high-precision tactical missile systems - VTRC - the beginning of the Ministry of Defense. These products have already received the informal name "pocket Iskander." Launchers compact VTRK will be placed on armored vehicles "Tiger" or "Typhoon." Despite their diminutiveness, the complexes should hit any targets - equipment, fortifications, as well as points of contact and control. They are designed to deliver high-precision strikes in the rear of a potential enemy at a depth of 100 km. VTTRK will help divisions and brigades to establish close cooperation with drones, reconnaissance vehicles and connection formations. The Defense Ministry told Izvestia that the military department approved the concept of high-precision tactical missile systems. Divisions VTRK will have to work closely with the intelligence of land brigades and divisions. When carrying out operations, they will be able to use information from the units of the unmanned aerial vehicles (UAVs). Also, the targets will be able to indicate the fighters using the Sagittarius complexes. Unlike the Iskander, the VTRC missiles will not be ballistic. If necessary, the operator or electronics will be able to retarget it in flight - this will make a bilateral electro-optical system for transmitting images and information. At the same time, the VTRK missiles will be practically not vulnerable to air defense and missile defense, as they are protected from electronic exposure.